Governor Cuomo announced nearly $17 million will be disbursed to grow and sustain 22 projects that are spurring economic growth and opportunity statewide. The funding, recently approved by Empire State Development’s Board of Directors, supports projects that are directly creating 1,293 new jobs and retaining 1,568 existing New York State jobs – many of which have already been created or retained. This funding will also leverage nearly $200 million in private investments and other public funding to support local businesses and major projects that are building a strong foundation for future economic growth and job creation. To see the full list of projects, please click here. Governor Andrew M. Cuomo announced the commencement of $24.2 million in safety enhancements at Republic Airport in Farmingdale. The improvements will make activity into and out of the Long Island airport safer and more efficient, strengthening its capacity to serve the region by realigning the main runway, improving signage and lighting, installing a perimeter security fence and more. These Republic Airport enhancements are supported by $21.8 million in funding from the Federal Aviation Administration’s Airport Improvement Program and $2.1 million in State funding. Republic Airport supports approximately 1,400 airport-related jobs on Long Island, including 900 jobs on airport property. These enhancements will strengthen the airport’s critical role in serving Long Island by improving safety and efficiency and include: the realignment of runways 1-19; relocation of taxiway “G” and nearby hangars; realigning the airport’s perimeter road; improved signage, runway markings, lighting; and the installation of a security fence. This realignment enhances safety without the need to lengthen the runway. Republic Airport sits on 526 acres and features two asphalt runways, a two-story terminal, nine jet hangars and 467 aircraft. The airport is owned by New York State and operated by NYSDOT, and also serves as a New York State Police headquarters. It also serves as a staging area during emergencies for the New York State National Guard and the Federal Emergency Management Agency. The majority of funding for these enhancements is provided by the Federal Aviation Administration’s Airport Improvement Program, which provides grants to public agencies for the planning and development of public-use airports. Governor Cuomo announced completion of another round of targeted crude oil tank car and rail inspections. These inspections uncovered 62 defects, including one critical safety defect that required immediate corrective action. The inspections are part of the Governor’s push to protect New Yorkers from the potential dangers associated with the transport of crude oil by freight rail companies. State and federal teams examined 524 crude oil tank cars and approximately 152 miles of track and 38 rail switches in these inspections. Last week, inspection teams from the New York State Department of Transportation and the Federal Railroad Administration carried out crude oil tanker inspections at the Canadian Pacific-owned Kenwood Yard in Albany, Albany County; the CSX Corporation-owned Selkirk Yard in Albany County and Frontier Yard in Buffalo, Erie County; and the Buffalo & Pittsburgh-owned D&E Yard in Buffalo. The inspections focused on track, track hardware and tank car mechanical safety equipment, including wheels and brakes. The teams also performed hazardous materials inspections to ensure that equipment is in line with regulations, including valves, valve closures, and placards that describe the cargo being shipped. They also checked tank car inspection and pressure test dates. Additionally, they inspected the Canadian Pacific mainline track at the Kenwood Rail Yard in the city of Albany. Critical defects identify important maintenance issues that must be addressed immediately, but do not necessarily indicate safety lapses. Non-critical rail defects must be repaired within 30 days, while all tank car defects must be fixed before the train departs the yard. If that is not possible, the affected car will be pulled from the train to await repair. 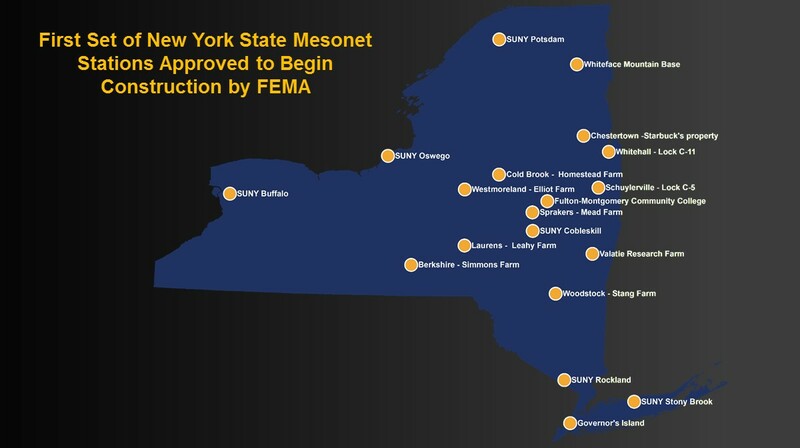 Governor Cuomo announced the approval of the first set of sites for New York State’s mesonet early warning weather detection system. A total of 19 sites located across the state are the first stations that will be part of a 125-site interconnected weather system. The system provides state-of-the-art, real-time weather condition data to support emergency management, research, and condition-dependent industries vital to New York’s economy, such as agriculture and energy production. Mesonet’s sophisticated stations provide localized, accurate, and timely data on air, wind, soil, and radiation conditions. Each mesonet station houses a suite of automated sensors, sampling data every three to thirty seconds. Data is then packaged into 5 minute averages, and then transmitted in real-time to a central facility located at the University at Albany. While at the University at Albany, data from all sites are quality-controlled and processed into files to be disseminated, including to National Weather Service and New York State Division of Homeland Security and Emergency Services. The New York State mesonet complements the existing National Weather Service system of 27 automated stations by expanding the number of sites currently available to collect weather data and increasing the frequency of reports available across New York. New York is the seventh state in the nation to install a mesonet system, and is the first to include a “vertical profiler” feature that provides more comprehensive temperature, wind and moisture information to further improve weather monitoring and prediction. Mesonet’s 125 station sites will be identified and operational by 2016. More information about New York State’s mesonet early warning detection system is available at http://nysmesonet.org. The Federal Emergency Management Administration has granted the construction and installation of mesonet weather stations in the first set of 19 locations below. A map of the locations is available here. Governor Cuomo announced appointments to his administration, adding to a team committed to implementing his agenda. Sandi Toll has been appointed First Assistant Counsel to the Governor. Karen Tyler has been appointed Executive Deputy Commissioner for the Office of General Services. Brian Matthews has been appointed the Chief Financial Officer for the Office of General Services. Letizia Tagliafierro has been appointed Deputy Commissioner of the Criminal Investigations Division at the New York State Department of Taxation and Finance. Jeffrey Nordhaus has been appointed Executive Vice President, Innovation & Broadband at Empire State Development Corporation. In this role, Mr. Nordhaus will oversee Governor Cuomo’s announced $500 million New NY Broadband Program, an initiative to expand broadband service to unserved and underserved areas of New York State. Mr. Nordhaus will also oversee New York’s venture capital program, including the $100 million New York Innovation Venture Capital Fund, amongst others. Theresa Egan has been appointed Executive Deputy Commissioner of the Department of Motor Vehicles. Jennifer Rivera has been appointed Assistant Vice President for Community Development at Empire State Development. Sumit Sud has been appointed Special Counsel to the Commissioner for Ethics, Risk and Compliance for the New York State Insurance Fund. Wendy Erdly has been appointed Special Counsel for Ethics, Risk, and Compliance for the State Liquor Authority and Agriculture and Markets. C. Harris Dague has been appointed Special Counsel for Ethics, Risk, and Compliance to the Commissioner for the Office for People with Developmental Disabilities. Paul Francis has been appointed Deputy Secretary for Health and Human Services. Kerri O’Brien has been appointed Chief Executive Officer for the State Liquor Authority. Greg Francis has been appointed Chief Investment Officer of The New York State Insurance Fund. Susan G. Rosenthal has been appointed General Counsel of the Roosevelt Island Operating Corporation. Manuel Rosa has been appointed the Director of Community Relations for Faith-Based Groups at New York State Homes and Community Renewal. Natacha Carbajal has been appointed Special Counsel to the Commissioner for Ethics, Risk and Compliance for the Department of Labor. Carey Merrill has been appointed Special Counsel to the Chief Information Officer for Ethics, Risk and Compliance in the Office of Information Technology Services. Governor Cuomo announced the opening of a new southbound Interstate 81 bridge over the Chenango River, a major milestone in the $135 million project to reconstruct the Prospect Mountain Interchange of State Route 17 and I-81 in the city of Binghamton and town of Dickinson, Broome County. The I-81 southbound Exit 4 off ramp to Binghamton and Hillcrest also is re-opening to traffic. The Prospect Mountain project includes constructing new bridges over the Chenango River, new concrete pavement, noise walls and Intelligent Transportation System (ITS) features that help manage traffic. The new I-81 northbound/Route 17 westbound bridge over the Chenango River was reopened earlier this month and the State Route 17 Prospect Street Interchange off-ramp opened to traffic this summer. The Route 17 westbound Prospect Street on-ramp and the I-81 southbound ramp to Route 17 westbound will both open this fall. The construction contractor for the project is L&T Construction of Richmondville, Schoharie County. Work began in March 2012 and is expected to be completed by the end of this year. School officials did not ensure that all required employees completed and submitted timesheets. The leave accrual spreadsheet for employees who were entitled to earn vacation time did not show beginning and ending balances of vacation time available. The district has not developed a formal reserve plan, appears to have overfunded the unemployment reserve, and did not have proper documentation for the establishment and use of certain reserve funds. District officials adequately monitored the district’s financial condition to maintain fiscal stability. During the period 2009-10 through 2013-14, accumulated fund balance in the general fund increased from $6.6 million to $9.8 million. District officials need to improve controls over the information technology assets. The board did not establish adequate IT policies and officials did not maintain software inventories. Key controls for payroll processing were not appropriately designed and operating effectively. Although the city had properly segregated payroll duties, management oversight was lacking. For example, city officials did not compare processed payroll registers to the approved time records. Auditors also found that time records for department heads were not reviewed or approved by the mayor before being submitted to the treasurer. District officials did not maintain complete and accurate fuel inventory records and could not account for 17,560 gallons of gasoline, valued at nearly $55,000. The district did not ensure compliance with its board-adopted vehicle use policy and as a result had no assurance that fuel was used only for legitimate district purposes. This included more than 10,000 gallons of gasoline, valued at $31,277, used by a district chief to commute to and from his place of employment in New York City. Auditors also identified questionable charges for out-of-state travel and local meals on the district’s credit cards totaling $26,809. Town officials were unable to effectively monitor financial operations because the town’s financial accounting system was inadequate and the town’s accounting records were inaccurate and incomplete. The town’s accounting records did not support the amounts reported to the Office of the State Comptroller, including more than $850,000 in fund balance variances. Auditors also found the town could not account for almost 24 million gallons of water valued at $30,900. Town officials did not always follow the requirements of the town’s procurement policy for purchases requiring quotes. In addition, the claims auditing process was not consistent with town law. Tax revenues of $8.1 billion in June were stronger than expected, and collections for the first quarter of the fiscal year were $748.5 million higher than projections in the Enacted Budget Financial Plan, according to the monthly state cash report issued by New York State Comptroller Thomas P. DiNapoli. The General Fund balance totaled $11.1 billion at the end of June, almost $1.9 billion higher than projected. June tax receipts were $606 million higher than projections for the month. Overall growth of 7.7 percent from the previous year included especially strong gains in quarterly estimated personal income tax payments and estate and gift taxes. Total tax receipts of $20.6 billion for the quarter were $1.9 billion higher than the same period last year, an increase of 10.2 percent. Tax collections benefitted from an 18.3 percent increase in Personal Income Tax (PIT) receipts in the first quarter, including especially strong growth in April that is not projected to be replicated later in the year. The first-quarter growth in PIT receipts was partially offset by a 23.9 percent decline in business tax collections as a result of increased refunds and the absence of large audit receipts. Consumption and use tax collections totaled $4 billion through June 30, $37.7 million higher than projections. Business tax collections through June totaled $1.8 billion, $69.6 million higher than projections. Other tax collections totaled $1 billion through June, a year-over-year increase of $195.5 million, resulting primarily from a $143.9 million increase in estate and gift tax collections. This was $113.2 million over current projections. All Funds receipts totaled $39.2 billion through June, $1.4 billion higher than projections. Miscellaneous receipts were $376.1 million above anticipated levels, which was primarily realized in May as a result of an unanticipated $485 million monetary settlement. Federal receipts totaling $11.1 billion were $301 million above projections, primarily in Special Revenue funds. All Funds spending of $33.8 billion in the first quarter of the fiscal year was up by $1.3 billion, or 4.2 percent, from the previous year. Spending for local assistance programs totaled $25.4 billion and was 6.3 percent, or $1.5 billion, higher than last year. Departmental operations totaled $4.7 billion through June, which was $25.4 million more than a year earlier. Debt service totaled $584.5 million and was $96.3 million lower than last year. Attorney General Eric T. Schneiderman joined 44 other state attorneys general calling on five major phone companies to offer call-blocking technology to their customers. In a joint letter to the chief executives of the carriers, the attorneys general said a recent Federal Communications Commission (FCC) rule clarification confirms that telecommunication service providers can offer customers the ability to block unwanted calls, and verifies that federal law does not prohibit offering the services. Attorney General Schneiderman said call-blocking options already exist for Voice over Internet Protocol (VoIP) phone service (NoMoRobo.com) and Android cell phones (Call Control), and the phone carriers should move quickly to implement and inform their consumers of these options. Attorney General Eric T. Schneiderman announced that his office has filed a court action to shutter the National Children’s Leukemia Foundation (NCLF), and to hold accountable its founder, its president, its vice president, who is the founder’s son, and its auditor. The lawsuit comes after an investigation by the Attorney General’s Charities Bureau allegedly revealed that the NCLF, which touted itself as a leading organization in the fight against leukemia, did not conduct most of the programs advertised on its website and in its solicitations – including claims it operated a bone marrow registry and fulfilled the last wishes of dying children – and flouted critical filing obligations required of it under New York law. The court papers charge that, despite claims it had a board of directors and other significant financial and scientific controls, the two-decade-old organization was largely a one-man operation, run by founder Zvi Shor, 64, out of the basement of his Brooklyn home. NCLF’s president and vice president are alleged to have breached their duties to the organization and to have aided and abetted Shor in running the organization; the auditor is accused of making false filings. Filing false audit reports, when no audits were in fact conducted. As the petition charges, between April 2009 and March 2013, NCLF collected approximately $9.7 million in revenue from thousands of donors across the country. Of that, $8.9 million was solicited by professional fundraisers hired by Shor, who were in turn paid approximately $7.5 million – or 83% – of the money raised. Of the remaining funds, according to the organization’s filings, the organization spent less than 1% percent – $57,541 – of its income on direct cash assistance to leukemia patients and transferred another 5% – $655,000 – to a shell organization in Israel run by Shor’s sister, allegedly for research purposes. Over the same time period, Shor was paid a salary of nearly $600,000, and awarded himself another $600,000 in deferred compensation. The Attorney General’s investigation found that NCLF’s president, Yehuda Gutwein, 58, who lives in Brooklyn, was president in name only. Gutwein, a certified public accountant, took over the title in May 2010, when reports surfaced that Shor, who had been president since the organizations 1991 founding, was convicted of felony bank fraud in the Eastern District of New York in 1999. Shor’s son, Shlomo Shor, 43, also of Brooklyn, stepped in as a director and vice president, but did nothing other than sign checks and forms, as he was ordered to do by his father. Standing at the Long Island Maritime Museum, U.S. Senator Kirsten Gillibrand and Attorney General Eric T. Schneiderman, joined by Suffolk County Legislator Bill Lindsay III and Adrienne Esposito, Executive Director of Citizens Campaign for the Environment announced a new push to ban plastic microbeads in personal care products. Senator Gillibrand introduced the bipartisan Microbead-Free Waters Act of 2015, legislation to federally ban cosmetics containing synthetic plastic microbeads. Attorney General Schneiderman’s bipartisan bill, also called the Microbead-Free Waters Act, would prohibit the sale and distribution of personal cosmetic products containing microbeads. Plastic microbeads are found in personal care products like facial scrubs, body washes, hand cleansers, and toothpaste. These products are designed to be rinsed down the drain, but the microbeads are too small to be captured by wastewater treatment plants. They subsequently have been found in large bodies of water across New York State, where they concentrate toxins and can be ingested by birds and fish, posing serious environmental and health risks. An April 2015 report released by Attorney General’s office found that microbeads were present in 74% of water samples taken from 34 municipal and private treatment plants across New York State. The plastic microbeads could have a devastating effect on the state’s fish populations, hurting the commercial and recreational fishing industries, tourism industry, and the general economic well-being of the state’s coastal communities. Attorney General Eric T. Schneiderman announced that more than 1,000 firearms have been turned in to law enforcement through his statewide gun buyback program. The Office of the Attorney General (OAG) reached this milestone at a buyback at the Huntington Manor Fire Department, the latest law enforcement collaboration among OAG, Suffolk County Executive Steven Bellone, and the Suffolk County Police Department. Under the program, both working and non-working firearms are accepted. There is no limit on the number of firearms an individual can return, but licensed gun dealers and active or retired law enforcement officers are not eligible to participate. Debit cards with the appropriate amount are issued after each unloaded gun is received and screened by the officers on site. Assembly Speaker Carl Heastie joined with Assembly members Bill Magnarelli and Al Stirpe to announce $400,000 in funding for Crouse Hospital’s opiate and heroin abuse prevention and treatment program, which provides services to patients from Syracuse and the surrounding 16 counties. In addition to inpatient and outpatient rehabilitation services, Crouse Hospital also operates the only methadone program in Central New York. Opioid Addiction Treatment and Hospital Diversion Demonstration Program, a new model of detoxification and transitional services which provides short-term residential and peer support services for individuals seeking treatment for heroin and opioid addiction, with the intent to reduce the reliance of emergency room services. Heroin and Opioid Wraparound Services Demonstration Program, a program providing heroin and opioid addiction wraparound services to adolescents and adults who are in treatment, and for a period up to nine months after the completion of such treatment. These services include case management, peer supports, employment support, and transportation assistance.